UNITED NATIONS, May 14 -- Eight weeks after the UN's humanitarian coordinator for Somalia Eric Laroche advised his UN colleagues and NGOs to cast their lot with the UN-supported Transitional Federal Government, his boss John Holmes called for an investigation of potential war crimes involving the TFG. Holmes' weekend visit to Mogadishu was cut short by a series of bombs. In New York, the UN's spokesperson initially read out that Holmes' "mission had to be cut short for security reasons and plans for a second day in Somalia were cancelled. Nevertheless, in discussions with President Abdullahi Yusuf Ahmed and Prime Minister Ali Mohamed Gedi, Holmes did have the opportunity to stress that the Transitional Federal Government needs to provide a more enabling operating environment for aid workers." 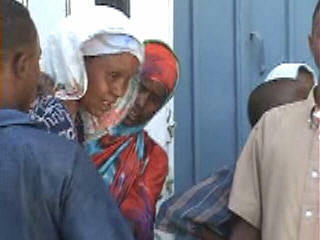 "a bomb exploded a few minutes after he arrived in the Somali capital on Saturday. And, I guess, there were two other bombs that went off within half an hour, all on the path of his itinerary. And personnel from the African Union Mission to Somalia defused the fourth explosive device, also on the route of his itinerary." A reporter asked, "does this mean there's a position towards the United Nations, and that�s why they would target a senior official with all these bombs?" Spokesperson: Well, I�m not saying that he was personally... I was just saying that bombs exploded on his itinerary. We cannot draw the conclusion that he was the target... I�m just saying that the bombs happened to be on his itinerary. Inner City Press: Who in the United Nations system remains in Mogadishu? Is [Eric] Laroche there? What is the United Nations presence, international presence, in Mogadishu at this time? Inner City Press: If you could figure out what the presence is there. Inner City Press: You also mentioned Lonseny Fall being in Mogadishu. The conference -- is the UN going to have any role in actually funding the conference, because I think that the TFG [Transitional Federal Government] is on record as saying they don't have funds for it. It's not only safety but there's a funding problem. So I'm wondering, what role will the UN have in funding the reconciliation conference? We'll have more on the funding mechanisms, and the demands. Matthew, The WFP Somalia Country Director, Peter Goossens, met USG Holmes in Nairobi before the USG went to Mogadishu on Saturday and USG Holmes discussed various issues there with the government and others -- as reflected in the news conference he gave in Nairobi today. On the number of WFP staff in Mogadishu, we have a total of seven full-time WFP staff in Mogadishu and we have a total of 196 staff (31 international, 165 national) in all of WFP Somalia, including Nairobi and 11 field offices in Somalia itself.